Thistle sailor Trey Harlow is the AYC 2012 Club Champ. 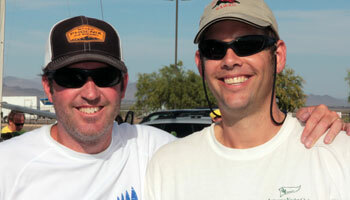 After seven races in Thistles at Lake Pleasant Saturday, 5/5, Trey and crew Dave Willis were the clear winners over a field of fleet champions. There is no second place in the club championship, but let’s just say that official numbers (see below) put reigning champ Martin Lorch in that unofficial spot. The windward-leeward races were run in a wide variety of conditions, from drifting to a couple gusts that must have topped 30 kts. Many thanks to the Thistle fleet for providing the one-design boats and to a flock of race committee people, including PRO Ben Doane. Besides Trey and Martin, competitors included Matt Davis, Mike Ferring, Greg Woodcock, George Sheller, and Alexia Lorch. Norm Anderson was not able to make the event. 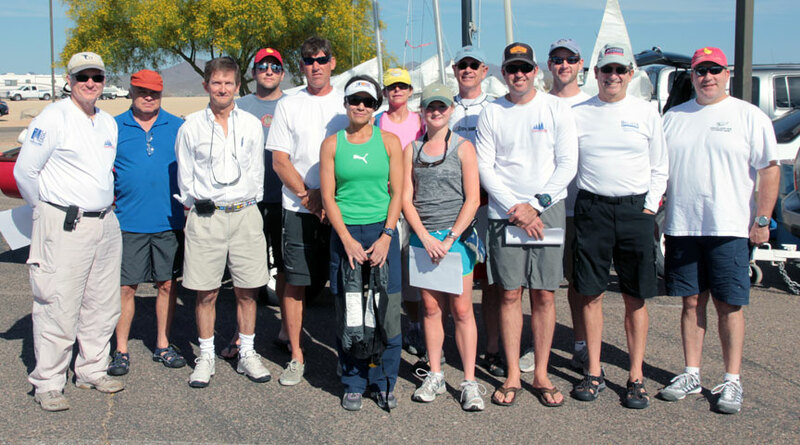 The Class Photo: Fleet Champs & Crew. From left: Greg Woodcock, Dan Perrine, Martin Lorch, Mike Davis, Steve & Christina Campos, Sheila Reed, Alexia Lorch, George Sheller, Champ Trey Harlow, Matt Davis, Mike Ferring and Peter Lehrach. Not pictured: Dave Willis (but he's in the shot above).